Visit Palace of Versailles and Eiffel Tower for their historical value. Musee d'Orsay and Musee Rodin will appeal to museum buffs. Take a break from Paris with a short trip to The Trianons & The Hamlet in Versailles, about 48 minutes away. There's lots more to do: admire the masterpieces at Louvre Museum, wander the streets of Montmartre, pause for some serene contemplation at Sainte-Chapelle, and don't miss a visit to Basilique du Sacre-Coeur de Montmartre. To find where to stay, reviews, traveler tips, and more tourist information, you can read our Paris trip planning app . Durango, USA to Paris is an approximately 18.5-hour flight. The time zone changes from Mountain Standard Time to Central European Time, which is usually an 8 hour difference. When traveling from Durango in September, plan for little chillier days and a bit warmer nights in Paris: temperatures range from 70°F by day to 53°F at night. Wrap up your sightseeing on the 20th (Fri) to allow time to travel to Castelnaud-la-Chapelle. On the 21st (Sat), step into the grandiose world of Chateau de Castelnaud, step into the grandiose world of Chateau de Beynac, then take in nature's colorful creations at Les Jardins de Marqueyssac, and finally explore the historical opulence of Chateau des Milandes. To find where to stay, other places to visit, photos, and more tourist information, read our Castelnaud-la-Chapelle trip builder . Getting from Paris to Castelnaud-la-Chapelle by combination of flight and taxi takes about 3.5 hours. Other options: drive; or take a train. Traveling from Paris in September, you will find days in Castelnaud-la-Chapelle are a bit warmer (76°F), and nights are about the same (51°F). Cap off your sightseeing on the 21st (Sat) early enough to go by car to Carcassonne Center. 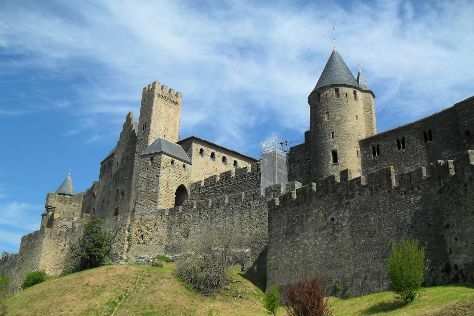 Kick off your visit on the 22nd (Sun): steep yourself in history at Cathar Castles, step into the grandiose world of Cité de Carcassonne, pause for some serene contemplation at Eglise Saint-Nazaire, then explore the historical opulence of Chateau Comtal, then get to know the fascinating history of Carcassonne Medieval City, and finally pause for some serene contemplation at St. Vincent's Church. To find maps, other places to visit, where to stay, and more tourist information, use the Carcassonne Center road trip app . Traveling by car from Castelnaud-la-Chapelle to Carcassonne Center takes 3.5 hours. Alternatively, you can take a train; or take a bus. Traveling from Castelnaud-la-Chapelle in September, plan for a bit warmer nights in Carcassonne Center, with lows around 58°F. Finish your sightseeing early on the 22nd (Sun) so you can drive to Aix-en-Provence. Start off your visit on the 23rd (Mon): steep yourself in history at Paul Cezanne’s Studio, then take in the spiritual surroundings of Paroisse Cathédrale Saint Sauveur Aix-en-Provence, then see the interesting displays at Site Memorial du Camp des Milles, and finally take in the spiritual surroundings of Basilique Notre-Dame de la Garde. Get ready for a full day of sightseeing on the 24th (Tue): step into the grandiose world of Chateau de Lourmarin, examine the collection at Fondation Vasarely, then examine the collection at Granet Museum, and finally take a stroll through Cours Mirabeau. To see maps, traveler tips, photos, and more tourist information, refer to the Aix-en-Provence day trip planning site . Traveling by car from Carcassonne Center to Aix-en-Provence takes 3 hours. Alternatively, you can do a combination of train and flight; or take a train. Expect a daytime high around 79°F in September, and nighttime lows around 61°F. Wrap up your sightseeing on the 24th (Tue) early enough to drive to Nice. On the 25th (Wed), see the interesting displays at Musée Marc Chagall, explore the world behind art at Museum of Modern and Contemporary Art, and then take a stroll through Vieille Ville. Get ready for a full day of sightseeing on the next day: take a stroll through La Croisette, explore the galleries of Villa & Jardins Ephrussi de Rothschild, and then contemplate the long history of Palais Lascaris. Start your trip to Nice by creating a personalized itinerary on Inspirock. Traveling by car from Aix-en-Provence to Nice takes 2 hours. Alternatively, you can take a bus; or take a train. In September, plan for daily highs up to 76°F, and evening lows to 65°F. 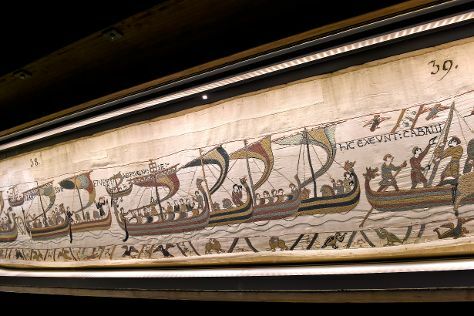 Finish up your sightseeing early on the 26th (Thu) so you can travel to Bayeux. On the 27th (Fri), take an in-depth tour of Musee de la Tapisserie de Bayeux, then explore the different monuments and memorials at Bayeux War Cemetery, then explore the different monuments and memorials at American Cemetery & Memorial, and finally take in the history at Omaha Beach. On the 28th (Sat), you'll have a packed day of sightseeing: take an in-depth tour of Pegasus Memorial (Memorial Pegasus), stroll the grounds of Beny-sur-Mer Canadian War Cemetery, then contemplate the long history of Pointe du Hoc, and finally witness the site of a historic battle at Musee du Debarquement Utah Beach. Inspirock's itinerary builder makes planning a Bayeux trip simple and quick. Getting from Nice to Bayeux by flight takes about 4.5 hours. Other options: do a combination of train and flight; or drive. Prepare for a bit cooler weather when traveling from Nice in September: high temperatures in Bayeux hover around 69°F and lows are around 52°F. Wrap up your sightseeing on the 28th (Sat) early enough to drive to Rouen. 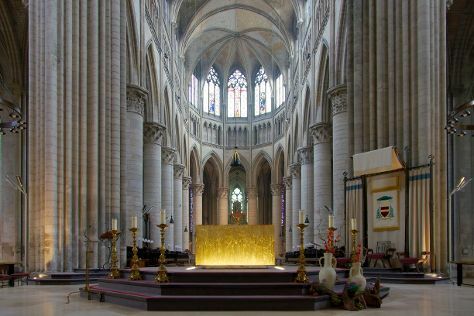 Start off your visit on the 29th (Sun): contemplate the long history of Place de l'Aitre de St. Maclou, take in the spiritual surroundings of Cathedrale Notre-Dame de Rouen, take in the spiritual surroundings of St. Maclou's Church, take in the exciting artwork at Ecole Supérieure d'Art et Design Le Havre-Rouen, then take in the spiritual surroundings of St. Ouen's Abbey, and finally examine the collection at Musee Secq des Tournelles. Here are some ideas for day two: explore the world behind art at Musee des Beaux-Arts de Rouen, contemplate in the serene atmosphere at Eglise Saint-Godard, and then admire the striking features of Eglise Sainte-Jeanne-d'Arc. To see more things to do, traveler tips, and other tourist information, you can read our Rouen tour itinerary builder tool . Drive from Bayeux to Rouen in 2 hours. Alternatively, you can take a train; or take a bus. In September, daytime highs in Rouen are 68°F, while nighttime lows are 50°F. Wrap up your sightseeing by early afternoon on the 30th (Mon) to allow time for travel back home.